Choosing the right resume format is crucial for job hunters. Learn about the three main formats, so you can pick one that gives you the best chance to succeed. Regardless of background, everyone deserves a chance to put their best foot forward when hunting for jobs. Picking the correct resume format will help you do so by highlighting your marketable traits and downplaying areas of weakness. There is no best resume format out there for job seekers. However, some work better than others. It simply depends on your personal situation. Each format has its own unique characteristics, and highlights different areas of strength. Depending on your particular background, one will be more suitable for you than the others. A chronological resume (sometimes referred to as a “reverse-chronological” resume) is the format where your most recent work experience is listed at the top of your experience section. This means that the hiring manager will first read your current (or most recent) job, and continue down the page until they reach your oldest piece of relevant experience. This structure allows you to present yourself in terms of your promotions and upward career mobility. It is therefore particularly useful for entry to mid level applicants looking to boost their careers. Contact Information – Consistent across all three resume formats, your contact details should be outlined near the top. Resume Introduction – The career objective is often employed on chronological resumes because of its flexibility (anyone can use it). Work Experience – Central section of this format. It should reveal your positive development as a young professional. Additional Skills – Your skills section highlights relevant professional abilities. Nothing fancy here. Education – Less crucial than work experience. Awards & Honors – The finishing touches on what’s sure to be a great resume. I want to demonstrate a vertical career progression. I don’t have large work experience gaps. I have multiple gaps in my employment history. I am considering working in a new industry. Check out our in-depth guide and examples to learn more about what should be in included in a reverse-chronological resume. The functional resume format frames a candidate in terms of the skills and abilities they believe are most relevant to the job opening. Unlike the reverse chronological resume, the functional format ignores when and where the candidate learned or performed those skills. Instead, it simply lists them at the top of the resume in order of most relevant to least relevant. Contact Information – An important part of all resumes (double // triple check for accuracy). 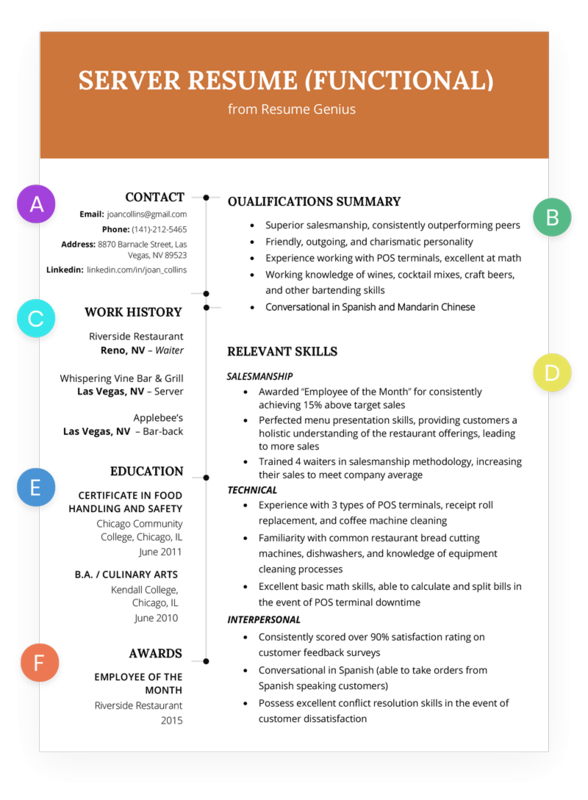 Resume Introduction – For a functional resume, a qualifications summary allows you to emphasize your skills if you lack consistent work experience. Work Experience – Note how small this section is, and how timeframes are omitted. Relevant Skills – Skills are crucial for someone without a clear work history, so try and fine-tune this section. It will be key to your success. Education – Include your highest degree, and list a key (relevant) certification if you possess one. Awards & Honors – Have any notable work-related awards? List the most significant here. I have unusually large gaps in my employment history. I am in the midst of a big career change into a new industry. I want to promote a specific skill set. I lack relevant or transferable skills. Take a look at our guide on functional resumes for more details on how to write one. A combination resume combines elements from the reverse-chronological and functional formats. It begins with a professional profile, resume summary, or summary of qualifications that quantifies a candidate’s professional achievements and abilities, and is then followed by a ‘core skills’ section. Job seekers who use this format generally want to market their impressive skill-set. Contact Information – Somewhere near the top. Resume Introduction – If you use a combination format, you’re most likely a highly skilled job applicant. Using a professional profile is a good way to quickly convey those skills to a hiring manager. Work Experience – Important, but you have the flexibility to emphasize your skills over experience if needed. Skills Sections – With your arsenal of work-related skills, you can divide them into two sections based on which are more important to the job. Education – This section is more of a formality if you’re using a combination format. Your skills and work history should hold the spotlight. I want to showcase a relevant and well-developed skill set. I want to transfer to a different industry. I am a master at what I do. I am a student or entry level candidate. I want to emphasize my educational experience. I lack relevant qualifications and skills. Learning how to use a combination resume format is a valuable skill you can carry with you throughout your professional career. To help you better understand the types of resume formats above, we’ve provided an example of each format below. Click the desired image to enlarge it, and scroll through the others to assess key differences. If these samples don’t suit you, we have many more on our new and improved resume templates mega-page. Check them out if you’re looking to get started! As we’ve already discussed at great length, job seekers have three main options when it comes to formatting their resume: 1. Chronological, 2. Functional, and 3. Combination. Each resume format has its own set of advantages and disadvantages for different kinds of job seekers, so be sure to choose wisely. Use the chart below to get a quick idea of which style would be best for presenting your unique job experience. In addition to using one of the three resume formats above, it’s also essential to know how to format the content. This includes things like length, alignment, fonts, and margins. Below are a few quick tips to help you make sure your CV is not only formatted correctly, but also looks great. When it comes to your contact information, however, it’s perfectly acceptable to center align the text – especially if you want that information to stand out. There are some unique circumstances when you might need to create a resume that exceeds one page, but 99% of the time it’s better to stick to one page in length. Maintaining one page keeps all your information organized and easily viewable in one place. For more detailed information on all of these tips and more, check out our guide to resume aesthetics. A little trick developed by our experts is to use .63″ left and right margins and 1″ margins on the top and bottom. Traditional resume formats use 1 inch margins all around, but by modifying the left and right sides to be .63″ it allows you to include more content and also makes your resume appear more robust by eliminating white space. It’s ok to use other margin lengths, but you should never go lower than .5″ or high than 1.25″ for any of your margins. A general rule of thumb is to use a font size of either 11 or 12. That being said, depending on the font style you use there is some leeway with the size, as some fonts appear bigger (or smaller) than others. As long as the font is easy to read and clearly presented on the page once printed, don’t be too concerned about going over or under the recommended size. If I apply a admin. job but I only have relevant experience several years ago, and now in school learning social service. How can I make my resume? Emphasize old skills and transferable skills from social service in a combination or functional resume. Good luck on the job hunt! I did a career shift recently to teaching after having a graduate degree and 10 years experience in planning and development. I have recently completed a graduate degree in education and have 2 years of teaching experience in a preschool setting and trying to now make the shift to elementary age. Do you think I should use a combination resume? You should list you internship after your employment. Good luck! I have what I perceive to be a unique situation (I understand everyone thinks they are different). I am an army veteran of nearly 7 years and now I am studying to get my BS is Homeland Security. I joined the army at 19 in 2006 and got out in 2013. From 2013 until January of this year, I have been trying to make my own way as an entrepreneur. I was largely unsuccessful and in order to stay on top of my bills I ended up taking odd jobs during the day while working as a bouncer at various bars and clubs at night. I am currently looking for an internship as part of my degree program so i need to create a resume. 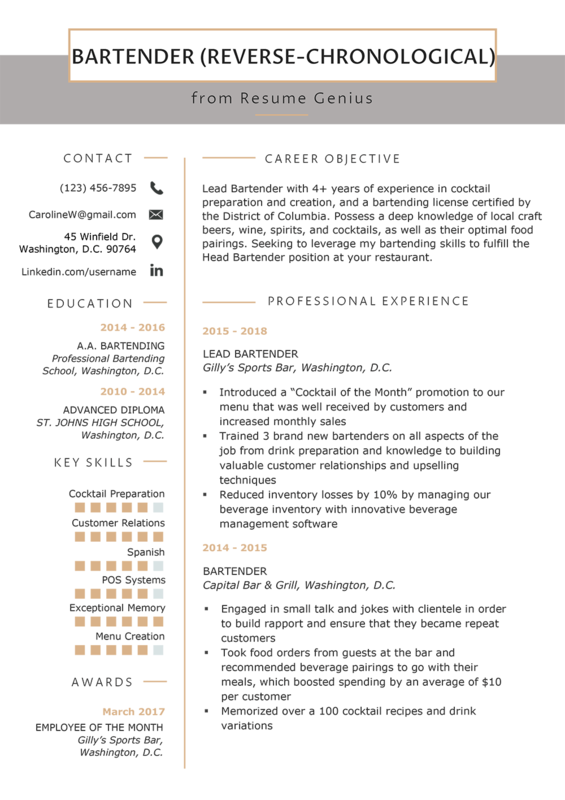 I thought a functional resume would be ideal so as to blur the past 3 years. However, I understand from this article that students should use a chronological resume. I need to know how firm that rule is. Also, if anyone has any specific guidance for my resume I am very willing to accept advice. Thanks. In your situation, we would suggest using a functional format. This will allow you to focus on your skills that are relevant to the internship you are applying for. Good luck on the job hunt and thank you for your service! Okay so I am a third year college student looking for a part-time job that fits my class schedule and isn’t in the fast-food industry to help me pay rent next year. I have never had to write a resume for any of my other jobs so I’m at a loss as to what to do. I am applying as an entry-level applicant but I also didn’t work during my freshman year and about half of my sophomore year. Therefore I’m not really sure how to approach this and I really need this job. Please help! Thanks! Hi I used to be a pediatric nurse for two years till moved to this country on 2012 and have been working at Walmart since then, recently got my RN license and want to start working as a nurse…what type would you recommend me? In your case, we suggest using a functional resume. Best of luck on the job hunt! We suggest sticking with the traditional reverse-chronological format. Best of luck! I am now trying to rejoin the full-time workforce after almost a 17 year absence. Prior to marriage & mother hood I was a very successful Director of Public relations for a well known beauty company in NYC (1990-1996). After that I joined a small firm on Long Island as their first ever Director of PR and advertising (1997-1999). Then babies came. 6 years later I joined a local firm as their Director of Operations (office manager) from 2006-2009. Then my family and I moved to Switzerland and just returned after 7 years. I was a teacher of English as a Second Language. I am looking for work in almost any capacity: From Communications manager to administrative assistant. I am struggling with how to present my resume. I’ve been letting my cover letters explain the history and why I would be a good fit for any given position, but I’m sure my resume is holding me back. Any ideas??? Thanks in advance! While I was in high school I did my internship at for State Farm. After I graduated I was offered a job there and stayed there for 2 years. I have recently worked at the National Instituted of Health for a year. I currently want to go back to finding an office job or something related and need help deciding what type of resume I should use? Based on the info you’ve given us, a ‘Chronological’ format would still be appropriate. Best of luck! Hi there! This is great. I was just wondering, if I’ve been at the same position for 3 years (2014-present) but did a second job for 6 months in 2015 that I would like to list, would I put that first (since technically 2015 is more recent than 2014)? Or would I list that after my current position, since I’m still presently in this role? Thanks! List your current position first. Best of luck! i want to change my career from planning and production officer to marketing after 3 yrs which resume format is suitable for me ? I did’nt need the additional skills portion on my resume. However, I did need a section to type in organizations I am a member of. You should be able to choose or write in atleast one of your own sections ?? You’re right — some candidates might not need a particular section. Once you’ve downloaded one of our free resume samples, you can change it to include sections you’d like to feature, like a section showing your membership information. Yes, a combination resume is the best resume format to use when you’re changing to a new field of work. 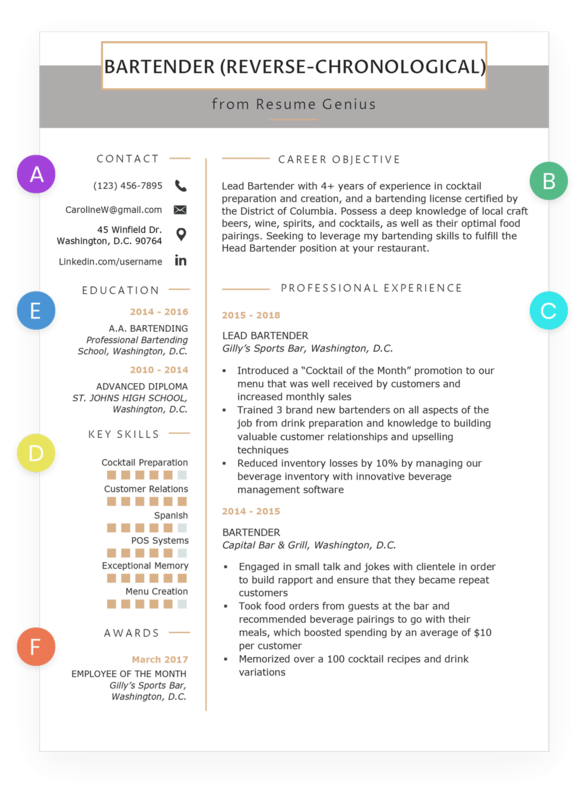 You can find more information about this resume style on our combination resume page, which features a writing guide and free samples.